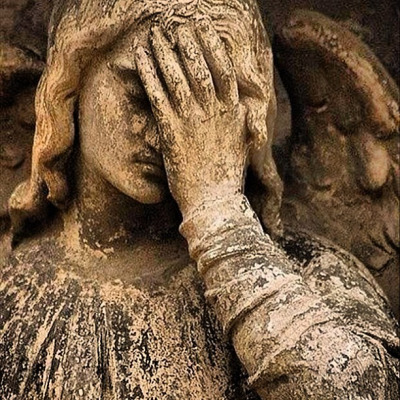 What's an angel's point of view when we're having a bad day? They are serving us ALL the time. Dare you to give some thought to what that means (let's just say privacy is not a barrier). By God's direction, they are powerful hands working "all things together for the better" for us on a daily basis (mind that context, Romans 8:28), but they do not see the future any better than we do. They do not share his omniscience, and this requires to them to have faith...a lot (especially for certain ones of us. You know who you are). So without letting my imagination run too wild, I catch myself in a funk sometimes and I think, If there's an angel with me today, he must be thinking, "I really wonder what this assignment is about. I hope this pays off," in the most selfless and faithful way possible of course. It's like a superhero babysitter with an I.Q. of 1000 assigned to keeping a stubborn child out of the street. And for the demons they have to fight in the process, I'm sure they still recognize us as the biggest hazard to ourselves. I truly look forward to rejoicing with them some day at how we turned out in the end. But for now I see them in the position of working very hard for very delayed gratification. They see God face to face, so they have no uncertainty about how worthwhile their labor is, but they're still getting paid on back side of the job. The least I can say is I'm very thankful for them. When scripture says we will judge angels, I imagine it to be the same sort of judgement that believers will face with God, mainly a rewarding of our works above and beyond the salvation we have by faith alone. When God gives me my spiritual pay day by His infinite grace (and I mean infinite), I'm going to turn to the angel(s) that saved my life (and my children's, and my wife's, and...) at least a dozen times and give him the most meaningful reward I can from what I've just received. Then we'll spend eternity laughing together about how crazy my first life was, and praising God that he got us both through it. It's just me thinking, so take it with a grain of salt. To the Kingdom.